September 13th was a chilly, rainy Saturday, but that didn’t stop patrons of The Open Door, Schenectady New York’s locally owned, independent bookseller since 1971. 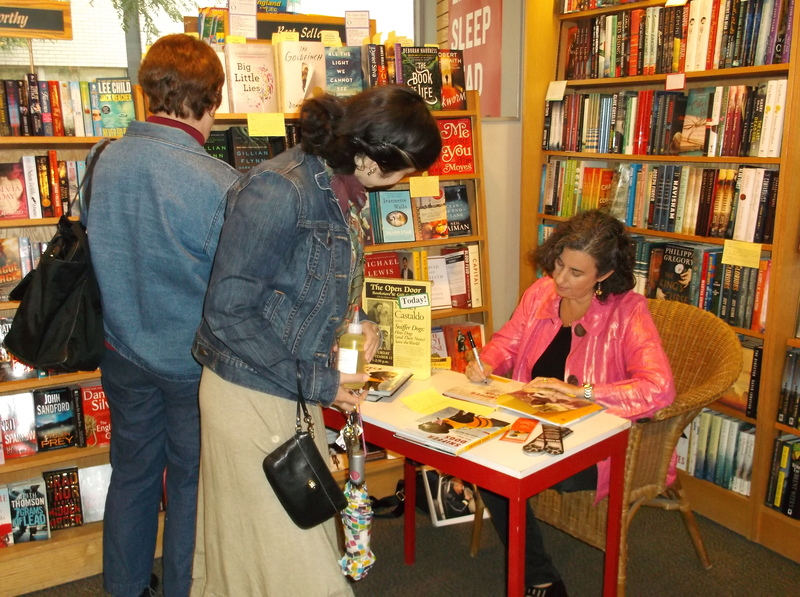 Inside the shop, the tone was sunny and cozy as author Nancy Castaldo greeted readers and signed books. A warm sense of community pervaded the bookstore while folks of all ages flowed in and out, meeting the author, chatting, browsing, reading, making their purchases, and then popping umbrellas open and stepping back into Jay Street’s raindrops. 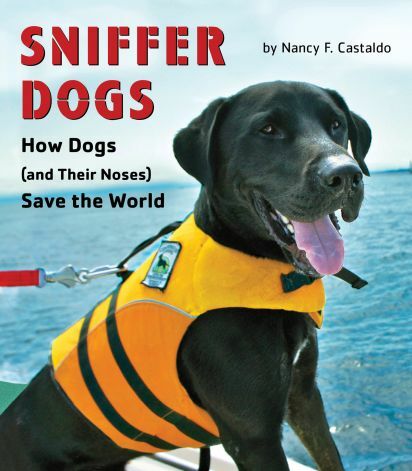 Nancy Castaldo’s current book, Sniffer Dogs: How Dogs (and Their Noses) Save the World, (Houghton Mifflin Harcourt) is a nonfiction children’s book for ages ten to fourteen. In Sniffer Dogs, we learn how detection dogs are able to use their noses to locate missing people, disaster victims, explosives, and illegal drugs, just to name a few from a long and specialized list. 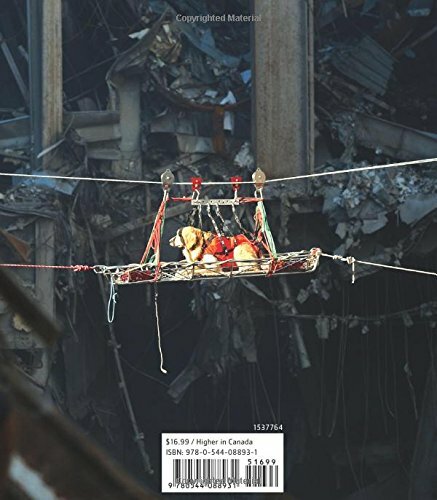 Although this book is written for children, I’m fascinated with the stories of these courageous and diligent canine heroes, and I’ve fallen in love with the full color photos capturing these dogs at work, at rest, and at those precise moments of intensity when they alert handlers to a find. Nancy Castaldo blended her biology and chemistry studies with her passion for writing and photography into a successful literary career and author of children’s books about science and animals. She writes to inspire kids to make their own discoveries and explore the world around them. Her books include Sunny Days and Starry Nights, Rainy Day Play, Winter Day Play, Oceans, Deserts, Rainforests, River Wild, Pizza For The Queen, Leap into Space, and Keeping the Earth Green. 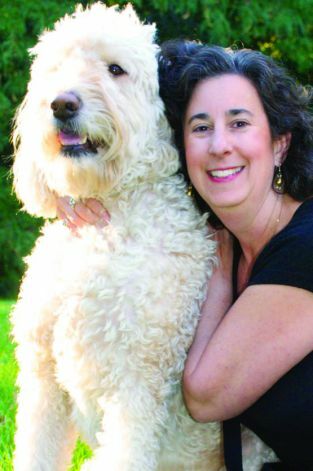 Nancy lives in the New York’s Hudson Valley with her husband, daughter, and a huge English Goldendoodle named Gatsby. SMP: The cover photo of Sniffer Dogs is delightfully eye catching, and inside, the images are beautiful with very appealing overall design. How much of the photography is your own, and how closely did you work with an art director? NC: Thank you. The designer on Sniffer Dogs, Rachel Newborn, was fantastic to work with. The majority of the photos in Sniffer Dogs are mine, but the photo of our cover dog, Tucker is not. I took photos throughout the research of the book and then submitted them with the final manuscript. Rachel took it from there to develop the eye-catching, kid friendly book design. It was wonderful to see the text and illustrations flow together so well. It was so much fun to photograph the dogs as I met them. They were the perfect subjects! SMP: When you wrote this book, did you start with a subtopic, for example, a type of sniffer dog, and then obtain photos to illustrate it, or did you start with particular photo that inspired you to further research and writing? NC: The stories of the conservation canines inspired this book. As I began to research each type of sniffer dog, I connected with various handlers and arranged to meet the dogs and photograph them. Some of the dogs have passed on or were unable to meet. SMP: Can you describe your writing routine or process? NC: I write everyday. I use a white board to plot out most of my nonfiction books before I begin them. It’s easy to get lost in the research – it’s so much fun. At some point I know it’s time to start writing. Of course, with all books there is research that continues as I write. I usually write one chapter at a time and follow the path on my white board. SMP: You’re a very well published author. The road to publication is fraught with bumps and ruts for so many writers. Please tell about your experience in publishing your work. NC: Publishing is a business. Writing is an art. 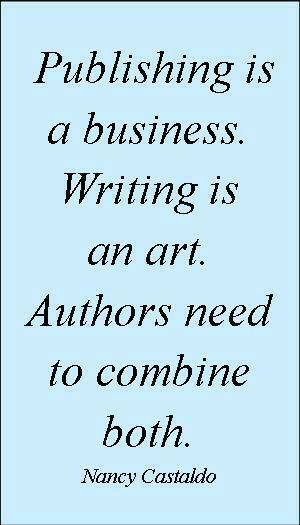 Authors need to combine both. They need to continually improve their craft and listen to the advice of their editors and critique buddies. They need to constantly read. They also need to keep up with the market and be persistent. I’ve been fortunate to have a dedicated critique group of fellow children’s authors for support and advice for over ten years. The Society of Children’s Book Writers and Illustrators, an international organization, has also been a tremendous resource for me. They not only supply publishing news and info, but also offer authors a supportive, engaging community. SMP: It seems that you have a genuine interest in engaging and inspiring young readers, writers, and scientists! Your website lists assembly and classroom presentations that you offer to connect with children in schools. Would you tell about your these visits and the students’ reactions to your program? NC: School and library visits are so much fun. Students inspire me and I hope I inspire them. Kids have the ability to make a difference in our world and I want to empower them with my visit. Through presentations on the path to publication and what it is like being an author, to workshops on research and how it can shape a book, I work to engage students and encourage them to think of their own work. SMP: What will be your next project? NC: I’m currently working on a book on seeds that will also include my photographs. The research for this book has taken me to some very interesting places, including California and Russia. SMP: Do you have advice for budding authors, young or old? NC: I think the best advice I can offer is to read! Reading books is the gateway to writing. It helps us develop our skills and recognize terrific sentences, plots, dialog, and characters. It’s also helpful to join a group of fellow writers. And check out SCBWI for lots of great resources and conferences if you are an aspiring children’s author. 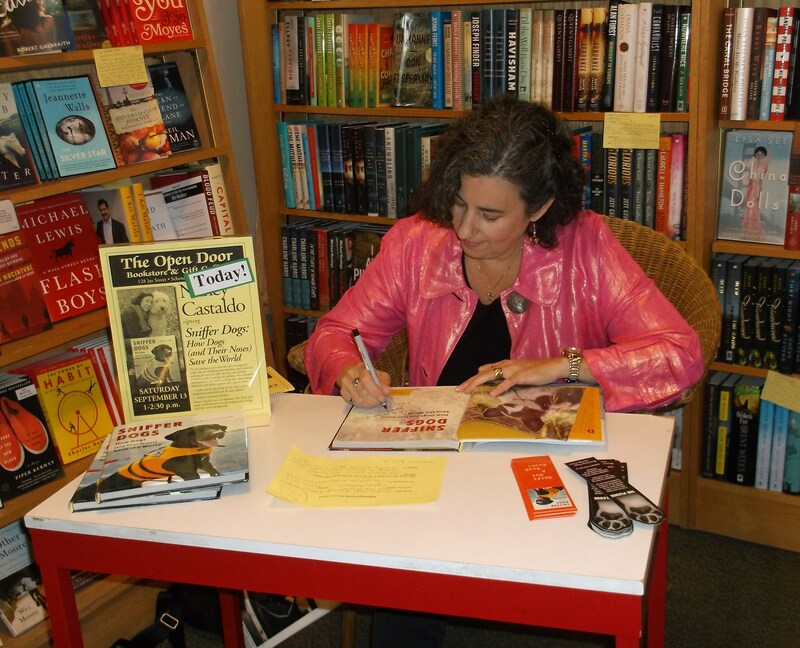 Thank you, Nancy Castaldo for your interview and your wonderful book about sniffer dogs! Categories: Uncategorized | Tags: author, children's book author, children's books, Detection dogs, publishing, rescue dogs, Sniffer Dogs, The Open Door Bookstore, writing | Permalink.